Please note: This is not an exhaustive list, but gives an indication of some of the resources we draw from as educators, which may also be helpful for you and your daughters. Some of the resources, particularly the websites, update continuously and we are in no way encouraging or endorsing their content in its entirety. Some may contain material or subject matter not suitable for younger children. Please use your discretion when viewing. Amy Poehler's Smart Girls. Dedicated to helping young people cultivate their authentic selves. Visit www.amysmartgirls.com. Women You Should Know. A digital media platform dedicated to telling the stories of women who are making change in their communities. Visit www.womenyoushouldknow.net. Girls' Inc. Inspiring girls to be strong, smart, and bold: Visit www.girlsinc.org. Girls' World. Online version of the magazine with freebies, polls, featured artwork and writing by girls for girls. Visit www.girlsworldmag.com. Girls' Life. Online version of the magazine with articles on style, fitness, crushes, life, books, etc. Visit www.girlslife.com. Powered by Girl. Online magazine by girls for girls. Visit www.poweredbygirl.org. The Brave Girls Alliance. Alliance that asks media creators to rethink products in development and ensure they teach girls to be strong, intelligent, and adventurous. Visit www.bravegirlswant.com. Teen Voices. Global girl news site that incorporates teen girls in the production of news about their lives. Visit womensenews.org/category/teen-voices. Project Girl. Girl-led initiative that combines art, media literacy, and youth-led activism. Visit www.projectgirl.org. New Moon Girls. Girls’ magazine and online community for girls. Visit www.newmoon.com. Sheheroes empowers young girls of all backgrounds to dream big, explore their interests and passionately pursue non-traditional careers. Through online content and video profiles, girls imagine their own potential by engaging with influential stories of exceptional, successful women role models across all fields. Visit SheHeroes.org here. Launched in 2012, MAKERS is a storytelling platform for the trailblazing women of today and tomorrow. Today, MAKERS.com features more than 4,500 original videos and more than 400 MAKERS interviews. MAKERS include well-known figures such as media mogul Oprah Winfrey, show runner Shonda Rhimes, YouTube sensation Lilly Singh, Supreme Court Justice Ruth Bader Ginsburg, tennis champion Billie Jean King, as well as groundbreaking women such as the NBA's first female referee Violet Palmer and Kathrine Switzer, the first woman to run the Boston Marathon. Learn more about MAKERS at www.makers.com. This documentary exposes how mainstream media contributes to the under-representation of women in positions of power and influence in America. It’s filled with interviews with politicians, entertainers, journalists, activists, and academics; statistics; stories from real teenage girls; and examples of some of the worst work of the media. Warning: it does showcase some graphic images. Watch the trailer and join the movement. SPARK is a movement by girls for girls against the sexualization, objectification, and violence against women in the media. Visit www.sparksummit.com. A research-based organization working within the media and entertainment industry to influence the need to dramatically improve gender balance, reduce stereotyping, and create diverse female characters in entertainment targeting children 11 and under. Visit www.seejane.org. Trains women and girls to become media savvy, curates original content from female writers, and monitors and calls out sexism in media. Visit www.womensmediacenter.com. The only conductor to ever lead the Boston Philharmonic Orchestra, Zander is a prophet of human potential and an unrivaled champion of joie de vivre. Watch as he helps unlock the boundless potential of a 15 year old cellist and teaches the entire audience what it means to live in a world of possibility. Watch here. Rachel Simmons, co-founder of the Girls Leadership Institute, speaks about how we must teach girls from an early age to be emotionally resilient, and how our culture sends young girls the wrong messages. She is joined by Claire Sannini, an 8th grade student who speaks about her tough experiences with girls her age and how she had to be resilient in order to change her situation and be happy with her life. Watch their TED Talk now. High school dropout turned Harvard faculty talks about how a simple new way of thinking helps nurture individual potential. Watch his TED Talk here. Sir Ken Robinson’s TED talk video and groundbreaking book, The Element, introduced readers to a new concept of self-fulfillment through the convergence of natural talents and personal passions. The Element has inspired readers all over the world and has created for Robinson an intensely devoted following. Now comes the long-awaited companion, the practical guide that helps people find their own Element. Buy here. We have all changed someone’s life — usually without even realizing it. In this funny talk, Drew Dudley calls on all of us to celebrate leadership as the everyday act of improving each other’s lives. Watch his TED Talk now. Bloom, Lisa. Think: Straight Talk for Women to Stay Smart in a Dumbed‐Down World. Vanguard Press, New York, 2011. In Think, Lisa Bloom examines the stark paradoxes that American girls and women live today, including excelling in education but obsessing over celebrities and tabloid media, in outperforming male counterparts in employment yet spending more time and money on appearances. Buy here. Damour, Lisa. Untangled: Guiding Teenage Girls Through the Seven Transitions into Adulthood. Ballantine Books, 2016. In this sane, highly engaging, and informed guide for parents of daughters, psychologist and Executive Director of the Laurel Center for Research on Girls Dr. Lisa Damour draws on decades of experience and the latest research to reveal the seven distinct—and absolutely normal—developmental transitions that turn girls into grown-ups, including Parting with Childhood, Contending with Adult Authority, Entering the Romantic World, and Caring for Herself. Providing realistic scenarios and welcome advice on how to engage daughters in smart, constructive ways, Untangled gives parents a broad framework for understanding their daughters while addressing their most common questions. Buy the book here. Siegel, Dan and Payne‐Bryson, Tina. The Whole‐Brain Child. Bantam Books, New York, 2012. In this pioneering, practical book, Daniel J. Siegel, neuropsychiatrist and author of the bestselling Mindsight, and parenting expert Tina Payne Bryson offer a revolutionary approach to child rearing with twelve key strategies that foster healthy brain development, leading to calmer, happier children. Buy here. Should you tell your kids they are smart or talented? Professor Carol Dweck answers this question and more, as she talks about her groundbreaking work on developing mindsets. She emphasizes the power of "yet" in helping students succeed in and out of the classroom. Watch the video here. Cain, Susan. Quiet: The Power of Introverts in a World that Can't Stop Talking. Broadway Paperbacks, New York, 2013. In Quiet, Susan Cain argues that we dramatically undervalue introverts and shows how much we lose in doing so. She charts the rise of the Extrovert Ideal throughout the twentieth century and explores how deeply it has come to permeate our culture. She also introduces us to successful introverts—from a witty, high-octane public speaker who recharges in solitude after his talks, to a record-breaking salesman who quietly taps into the power of questions. Buy here. Brené Brown is a research professor at the University of Houston where she holds the Huffington Endowed Chair. She has spent more than sixteen years studying courage, vulnerability, empathy, and shame, and is the author of four books: The Gifts of Imperfection, Daring Greatly, Rising Strong, and Braving the Wilderness. Learn more about Brown's work on her website. 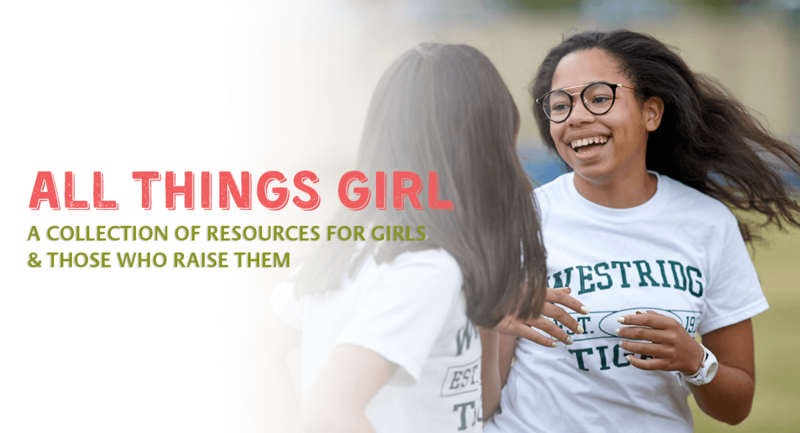 The Westridge Research Initiative (WRI) was founded in 2016 to identify, promote, and employ best practices in educating girls. WRI compiles an online archive of studies, articles, and other research on girls' social and emotional development, mindfulness, and other topics. View the WRI Research Archive here. Streight, David. Breaking into the Heart of Character: Self-Determined Moral Action and Academic Motivation. CSEE, Third Edition, 2015. The moral failures that made the headlines over the past decade did not take place because the guilty parties did not know the right thing to do, or because they did not know how to do the right thing. Too many ethical lapses took place, and take place, because someone just did not feel like acting for the common good. What helps kids feel like doing the right thing?Breaking into the Heart of Character outlines a compelling case with documented strategies that get past character talk and improve character action. Buy here. Seligman, Martin E. Learned Optimism: How to Change Your Mind and Your Life. Vintage Books, New York, 2006. In this groundbreaking national bestseller, Martin E.P. Seligman shows you how to chart a new approach to living with "flexible optimism." Drawing from more than twenty years of clinical research, Dr. Seligman outlines easy-to-follow techniques that have helped thousands of people rise above pessimism and the depression that accompanies negative thoughts and build a life of rewards and lasting happiness. Buy here. In this ground-breaking collection, Mary Helen Immordino-Yang―an affective neuroscientist, human development psychologist, and former public school teacher―presents a decade of work with the potential to revolutionize educational theory and practice by deeply enriching our understanding of the complex connection between emotion and learning. Buy here. Zakaria, Fareed. In Defense of a Liberal Education. W. H. Norton and Company, London, 2015. The liberal arts are under attack. The governors of Florida, Texas, and North Carolina have all pledged that they will not spend taxpayer money subsidizing the liberal arts, and they seem to have an unlikely ally in President Obama. While at a General Electric plant in early 2014, Obama remarked, "I promise you, folks can make a lot more, potentially, with skilled manufacturing or the trades than they might with an art history degree." These messages are hitting home: majors like English and history, once very popular and highly respected, are in steep decline. Buy here. Ritchhart, Ron. Creating Cultures of Thinking: The 8 Forces We Must Master to Truly Transform Our Schools. Jossey-Bass, San Francisco, 2015. As educators, parents, and citizens, we must settle for nothing less than environments that bring out the best in people, take learning to the next level, allow for great discoveries, and propel both the individual and the group forward into a lifetime of learning. This is something all teachers want and all students deserve. Buy here. Martinez, Sylvia Libow and Stager, Gary. Invent to Learn: Making, Tinkering, and Engineering in the Classroom. Constructing Modern Knowledge Press, Torrance, CA., 2013. There’s a technological and creative revolution underway. Amazing new tools, materials and skills turn us all into makers. Using technology to make, repair or customize the things we need brings engineering, design and computer science to the masses. Fortunately for educators, this maker movement overlaps with the natural inclinations of children and the power of learning by doing. Buy here. Berger, Warren. A More Beautiful Question: The Power of Inquiry to Spark Breakthrough Ideas. Bloomsbury, New York, 2014. In this groundbreaking book, journalist and innovation expert Warren Berger shows that one of the most powerful forces for igniting change in business and in our daily lives is a simple, underappreciated tool - one that has been available to us since childhood. Questioning - deeply, imaginatively, "beautifully" - can help us identify and solve problems, come up with game-changing ideas, and pursue fresh opportunities. Buy here. Our first WPA Meeting of the 2015-2016 school year was themed around Creating a Culture of Thinking. You'll find resources for 8 Cultural Forces that Define Our Classrooms, Defining Thinking Routines, and Making Thinking Visible: 10 Apps for Parents. A nonprofit organization for youth media literacy. Visit www.mediasmarts.ca. This website equips women and girls with tools to understand and resist harmful media messages that affect their self-esteem and body image. Visit www.about-face.org. As parents, we constantly focus on developing healthy habits! We love technology because it gives us access to information, expanded communication, games and entertainment and great shopping! But sometimes we become overwhelmed by technology and the devices begin to control us rather than us controlling the technology. Read more. Kids of all ages are swiping and scrolling, totally transfixed by screens of all sizes. Welcome to the new frontier of parenting. If you have questions on how to take control of the technology in your kids' lives, you came to the right place. Visit www.commonsensemedia.org. 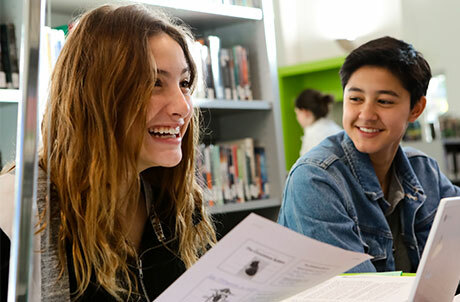 Check out our work at the Westridge Research Initiative, created to support girls learning at Westridge and beyond by providing ready access to current research, creating programs for teachers and parents, and supporting teachers in classroom innovation and research.